I was an early adopter of the term “enthusiasm gap” in the context of this year’s elections, having first applied it in August 2009 — a summer of town-hall protests and Tea Party rallies — to describe polling numbers for Democrats in Virginia and New Jersey, which were to vote for governor that year. Those polls suggested that there had been a significant shift in the electorate from the one that gave Democrats their majorities in 2006 and 2008. Indeed, the voters in Virginia that turned out for gubernatorial election in 2009 told exit pollsters that they had voted 51-43 for John McCain in 2008 — nearly the reverse of the 53-46 margin by which President Obama actually won the state. A similar pattern manifested itself in New Jersey, where the exit polls gave Democrats a 10-point partisan identification edge — down from the 16-point margin they had in 2008. When you hear the phrase “enthusiasm gap,” what you should really be thinking of is the turnout gap. “Enthusiasm gap” conveys the impression that it’s all about who has the most yard signs, or who is screaming and shouting the loudest, or who is most inclined to talk politics around the water cooler. But those things only matter to the extent that they affect turnout — the proportion of Democrats, Republicans and independents that come out and vote in November. In the context of polls, the enthusiasm gap manifests itself through likely voter models. Over the past month or so, the typical likely voter poll has projected a Republican turnout advantage of about 6 points, relative to the number of registered voters — although some pollsters have shown a gap that is considerably wider or smaller. Those 6 points are significant: were Democrats to have them back, it would alter the disposition of three to six Senate seats and around 25 House race, according to our latest set of forecasting models. These interrelated concepts — the enthusiasm gap, the likely-voter gap, the turnout gap — all get at the question: how engaged are one party’s voters relative to the others? And that’s mostly what we’re concerned with from the standpoint of forecasting elections — the relative standing of the two parties. It could mean that Democrats were particularly unenthusiastic, relative to a typical midterm election year — whereas Republican enthusiasm was about average. That would produce an enthusiasm gap, and would tell us a story about a depressed (or dissatisfied, or complacent) Democratic base. Or, it could mean that Republicans were unusually excited about the elections, while Democratic enthusiasm was just at par. That would also produce an enthusiasm gap. But it would be much more a story about Republican excitement than one about disarray in the Democratic base. In fact, it’s the latter explanation that seems to hold this year. The enthusiasm gap has more to do with abnormally high levels of Republican interest in the election than with despondent Democrats. The passage of the health care bill was a galvanizing event for each party’s base, and since then, enthusiasm in both parties has receded some. But, over the course of having asked this question four times this year (although they haven’t done so since June), Gallup found an average of 44 percent of Democrats citing a higher-than-usual interest level. That figure isn’t as good for the Democrats as 2006, when 50 percent of their voters were especially enthusiastic. But it is slightly better than the party’s standing in 2002, 1998 or 1994. Also, we should remember that the Democrats usually have some trouble turning out their base at the midterms, since they rely on constituencies, like young voters and racial minorities, who traditionally do not vote in large numbers in these elections. Their 2010 numbers, therefore, mostly reflect a return to normal (in fact, perhaps slightly better than normal). It was 2006, when Democrats were energized by the Iraq War and other perceived excesses of the Bush administration, that was the odd year out. If you don’t trust the polling numbers, we can also look at fund-raising data. The Times, for instance, reported last week that some major donors are cutting back contributions to the Democratic party. But what about donations among the party rank-and-file? Actually, Democrats are doing just fine there — or at least they were as of the Federal Election Commission’s most recent filing deadline on July 15. (The next comprehensive set of fund-raising reports will be released on Oct. 15.) In the chart below, I’ve plotted the aggregate amount of individual contributions — just those from regular voters, not donations from PACs or money contributed by campaign committees — received by all Democratic and Republican candidates who will appear on the Nov. 2 ballot for the House. I’ve also calculated the same figure — aggregate individual contributions as of the July 15 deadline — as they stood in prior election cycles. As of the July 15 filing deadline, the Democratic House candidates had collected a total of $168.5 million from individual donors. That’s actually slightly ahead of pace from 2008, when the total was $164.6 million (it’s also well ahead of pace from years prior to 2008). This isn’t necessarily a figure for Democrats to be all that proud of, since a higher percentage of their House candidates are incumbents than in past years, and incumbents have an easier time raising money. Still, it is hard to buy the idea of an exceptionally disinterested Democratic base when coming across numbers like these. What is more notable, rather, is the gains made by Republican candidates. 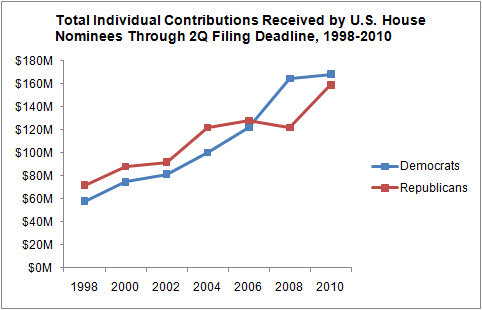 Their House nominees had raised $159.2 million through the July 15 deadline. While their figure was slightly behind that of Democrats, it nevertheless reflects a 30 percent increase over their pace from 2008. So, there is not actually much evidence of unusually deep problems among the Democratic base, as some commentators have suggested. Are there groups within the Democratic base which have not seen the progress they might have hoped for? Sure. Might Democratic enthusiasm have been higher — closer to 2006 levels — if these groups felt President Obama had done more for them? Probably. Would meeting their expectations have been politically feasible — and politically wise? You’d have to take up that question on a case-by-case basis. But stories that cite the enthusiasm gap as evidence of malaise among the Democratic base are probably miswritten. Such stories may conflate the priorities of certain subsections of the Democrats’ broad constituency — or of some especially vocal activists — with those of Democratic voters writ large, most of whom are focused on the poor economy and the government’s efforts to respond to it, as voters of all political persuasions are. Such analyses may also ignore the history of midterm elections, which suggest that Democrats usually do suffer from an “enthusiasm gap” of some kind. Finally, they may be burying the lead, which is the unprecedented level of political engagement by Republicans this year.